Nothing is better on a hot summer day than having a cool meal to chase away the heat. 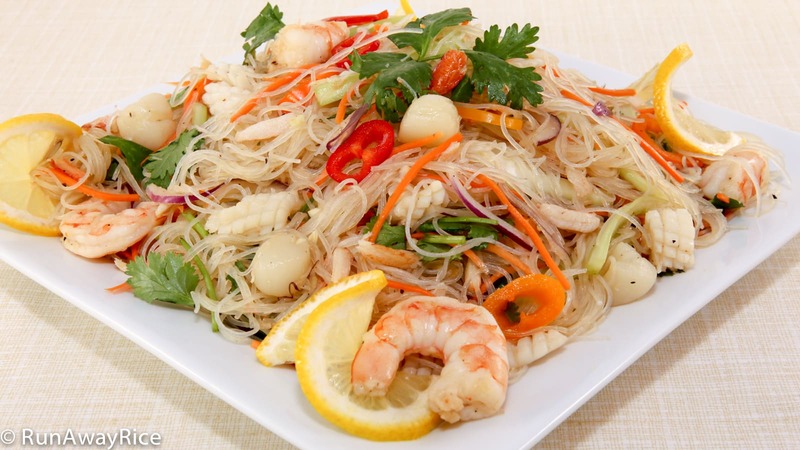 Abundant noodles with a medley of vegetables and seafood in a light dressing makes this dish super scrumptious and refreshing. 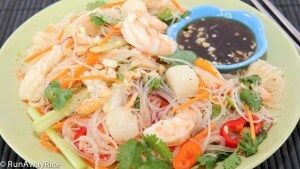 This noodle salad is so easy to toss together and can be served as a main meal or appetizer. If you need to prepare this dish ahead and chill in the fridge, even better, the salad will be wonderfully marinated. Bon Appetit! Use any type of seafood you like. For a shortcut, buy seafood that’s already cooked. Avoid over-soaking or over-cooking the noodles. They will become a sticky mess. Make sure to drain the seafood and noodles well. You don’t want a wet salad. Here’s a trick to try–put the noodles in a salad spinner. It does a great job of removing the water. The recipe below makes enough dressing for the entire salad. This is not a salad that’s drenched in dressing but is lightly seasoned. If you want more dressing to serve on the side, double the recipe below. Peel the carrots and then cut into 3-inch lengths. Shred the carrots using a mandolin or cut into long, thin strips. Cut the red onion into thin slices. Clean the celery stalks and cut into 3-inch sections. Cut each section into long, thin strips. Cut the sweet peppers into thin slices. Cut the larger seafood pieces into bite-sized pieces. Bring a large pot of water to a rapid boil. Add the raw seafood and cook for 2-3 minutes while stirring gently. Add the cooked seafood and swirl in the water for 1 minute. Transfer the seafood to a bowl of ice water and soak for 1 minute then drain well. Put the dried noodles into a large bowl and fill with cool water covering the noodles completely. Let rest for 5 minutes and then drain. Bring a large pot of water to a rapid bowl. Add the noodles and swirl in the boiling water for just 15 seconds. Quickly drain the hot water and then rinse the noodles with cold water. Drain. Fill a large bowl with ice water and soak the noodles in the bath for 1 minute. Drain well. Cut the noodles into shorter sections using scissors. Spread out the noodles and allow to air-dry for 15 minutes. In a measuring cup, combine lime juice, fish sauce, oyster sauce, sugar and garlic. Stir until the sugar is dissolved. In a large bowl, add a small amount of the glass noodle. Add small amounts of each of the vegetables and seafood. Drizzle with 1-2 Tbsp of the dressing. Continue making the layers until all of the ingredients are used. Add the black pepper. Toss everything combining well and making sure all ingredients are well-combined with the dressing. When serving, top the salad with the crushed roasted peanuts.